What with films like Waitress, Knocked Up and the upcoming Juno, this seems to be the year of the unplanned pregnancy in North American films – and many critics have asked why the women in these films don’t just have their pregnancies terminated. That is, beyond the obvious fact that, if these women were no longer expecting, there would be no more story. Now comes a film from Romania about a pregnant woman who does set out to procure an abortion. But she faces one major hurdle: the movie takes place in 1987, when Romania was ruled by the Communist dictator Nicolae Ceausescu and abortions were illegal. On a certain level, the new film is not about abortion, per se, but about the social and moral rot that festers in totalitarian societies, as experienced through the story of two women. 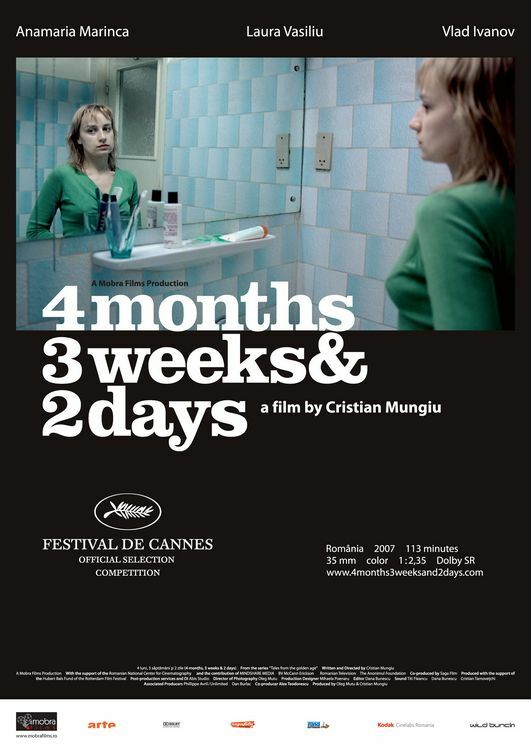 Gabita (Laura Vasiliu) is a university student who has already decided to have her baby aborted before the film begins. But on the day that she is to go to a hotel and meet with the abortionist, she lets her friend Otilia (Anamaria Marinca) take care of all the arrangements – which isn’t easy, given the callous bureaucracy at the hotels, the demands made by the abortion provider (Vlad Ivanov), and the constant threat of discovery. Abortion itself is not mentioned at all until about a third of the way into the movie, and by that point, we have seen people trafficking in contraband goods and using foreign cigarettes as a form of bribery. In this context, terminating a fetus could easily be just one of many activities which has been driven underground by a society built on fear and distrust. But this is no pro-choice propaganda flick; writer-director Cristian Mungiu does not push the view that all would be well if governments simply permitted the procedure. The final part of the film, which deals with the disposal of the aborted fetus, confronts the viewer with the procedure’s bloody aftermath, and underscores how even Gabita feels obliged to ask Otilia to bury the child, rather than throw it away. The only difference legalization would make there is that someone else would take care of the disposal. The women would not have to behold the results of the procedure, but the fetus itself – seen in a tight close-up that made audience members gasp when I saw the film at the Vancouver International Film Festival – would still meet the same fate. So is 4 Months, 3 Weeks and 2 Days a pro-life film, then? Not necessarily. But Mungiu’s film is an honest, bracing, compassionate, unflinching work of art, and quite possibly an even more balanced treatment of its subject matter than Mike Leigh’s Vera Drake, which was set in post-war England. It would be an excellent place to begin a dialogue on the subject.